is a 110 acre master planned, mixed-use business park in McAllen, Texas. 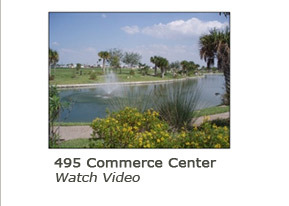 495 Commerce Center is the only Class "A" business park south of San Antonio and is professionally planned to put businesses on the fast tract to success. This prime development is thoughtfully designed with landscaping elements that enhance the whole park from the jogging trails to the central water feature focal point. is a secure investment. The business park offers various sized lots starting at 1 acre that are ultimately customized to fit the client's needs. An Owners Association and Common Area Maintenance program promote property values while the Architectural & Development Standards control building types, uses, mix, as well as the quality of construction, parking, landscaping and the architectural character of the project. is strategically located on 495 (Pecan) between McColl and Jackson, a prominent thoroughfare that offers high visibility and easy access to major transportation arteries (US Hwy 281 & Exp 83). This location provides excellent access to nearby international bridges, the Hidalgo County Courthouse, the medical districts, main post office, UPS & FedEx hubs and the McAllen international airport.